For some reason, each time Ryan, Nicole, and I decide to see a movie, we end up eating at GB. Unfortunately, neither of our favorite waitresses were working, so we got stuck with the worst waitress ever! (And not just because her make-up was heavy, dull, and gloomy.) She took forever to check on us, never bothered to see if our meals were what we ordered, and didn't even bother to say "Thanks!" when we paid the check. Despite horrible service, the food was quite good as usual. 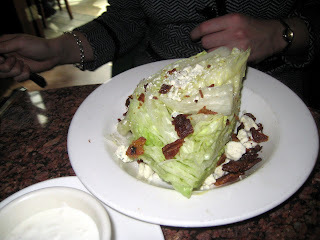 Nicole resorted to her new favorite: Wedge Salad. This time there was no water in the bottom of the bowl, the bleu cheese was chunkier (which she didn't like), and the bacon wasn't quite as fresh (but there was more of it). Yet, somehow, she said it was still great and she would continue ordering it. Ryan, for some unknown reason, decided to order the Old Fashioned Chop Salad. 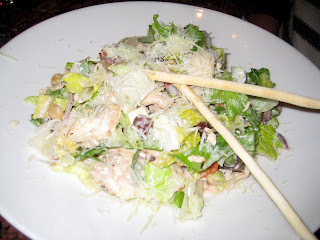 It actually looks great and comes with everything from chickpeas to chicken, pepperoni to and olive lemon vinaigrette. The portion was generous and Ryan ate every bite. "This is really good" should be proof enough you, too, should order it. 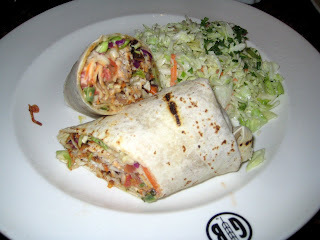 I enjoyed the fish so much during our last visit, I decided to try the Blackened Fish Wrap. The fish itself was actually quite good (moist and meaty), but was a bit lost inside the wrap with all the veggies and the "blackened" dressing. The overall flavor was really the dressing, but the hearty wrap was still worth eating. However, the coleslaw was dry and was seriously missing the dressing everyone has come to expect of "coleslaw". It's a bit tough to keep up the 4 Star rating given such sad service, but the food itself was still on par with our last visit and everyone was still quite happy with their choices.